Mapping your family tree is an obvious history starter project. Researching my family, however, is not very challenging as they have been a straightforward bunch. All four of my grandparents came from large families of relentlessly English stock – no exotic travels and no marriages to families from afar. Sadly, it would not make a fascinating television programme! The Burfords were a Surrey farming family settled outside Wimbledon by the 17th century (slightly before tennis became such a local feature.) Sons were generally called John, Thomas, George and James and daughters were mostly named Ann, Mary, Rebecca and Louisa. They married their neighbours and scarcely moved more than five miles from their Wimbledon headquarters in 200 years. 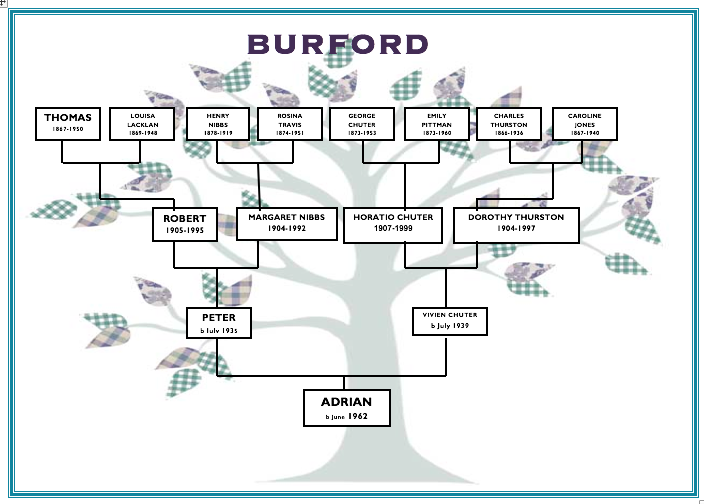 The repetition of Christian names between generations with large and overlapping numbers of children is probably the only challenging feature of Burford family research. – A farmer, Thomas Burford, born in Wimbledon in 1731 married a local girl, Elizabeth Parker. They had a son, John, in 1766. – John Burford was a bit of a slow starter and married Sarah quite late, but then had six children: Ann, John, Rebecca, Thomas, George and James between 1803 and 1815. He lived in Wimbledon all his life. 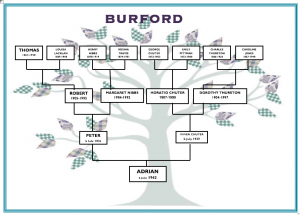 – John’s second son, Thomas Burford, was born in 1809 and was the first of the Burfords to make a match outside the village, marrying Sophia Wellington at St Luke’s Church in Chelsea in 1837 and going on to have four children: Mary, George Thomas, Emma and Ann. Although Thomas and Sophia remained in Wimbledon, as did their oldest child, Mary, who sadly died aged only 12, their three younger children all moved to London in the 1850s, living and marrying in Chelsea, Battersea, and Hackney and reflecting the mid-nineteenth century demographic trend from country to town. – George Thomas, who had been born in Wimbledon in 1839, married Ursula Day in Southwark in 1864. He was an unusually short-lived Burford, perhaps reflecting the differing health patterns of London life versus his ancestors’ more agricultural existences. However, while he died in Southwark aged only 38 in 1877, George Thomas and Ursula had five children: Richard, Thomas George, Louisa, Henry and Edwin. – Thomas George, son of George Thomas, was therefore of the first generation of “London” Burfords. Born in Southwark in 1867, he married Louisa Lacklan in 1890 and, conforming to their times, they had eight sons and one daughter: another Thomas George, then Sarah, Frederick, William, Walter, Edward, Robert, Herbert and Ernest. – Of these, Thomas and Louisa’s sixth son Robert, born in London in 1905 was my grandfather. Sadly because of my own parents’ separation and divorce I never met either Robert, or his wife, my grandmother, Margaret who died in Brighton in 1992, before Robert too died in Eastbourne in 1995. – However, Robert and Margaret’s son, Peter, my father, was born in 1935. – Robert Chuter, born in Ash, near Aldershot in Surret in 1660, married Sarah and had a son, John, in 1683 but then moved 10 miles North-East to Woking in about 1690. -John, clearly a bit of a live wire, married Suzanne Darling in Woking in 1714 and had a son the next year and, perhaps not so creatively, named him John too, before they all moved 10 miles South again, to Wonersh just South of Guildford. – John, son of John and Suzanne, born in 1715, then moved 5 miles South to Cranleigh in 1735. There John soon had a son he clearly did not pause too long before also naming John in 1736. – This John, son and grandson of John, however, moved from Cranleigh 15 miles North-West to Farnham, just 5 miles West of Ash where his family had lived a century earlier. Here he married Martha in 1791 and, clearly not a traditionalist, when his son was born in 1811, called him James. – James was clearly a dedicated Farnham man, marrying his wife Hariett Burchett there in 1834 and living his entire life at a house called Hoghatch in Farnham (there’s still a Hoghatch Lane in Farnham, but the houses now standing are rather newer than the Chuter’s old home. In Farnham, however, James and Hariett had 10 children, including a son, George, who was born there in 1846. – It was George, however, who, like the Burfords moving to London from Wimbledon around the same time, moved from Farnham to London aged just 19 in order to marry Eliza in 1865. – George and Eliza Chuter then had a son, also perhaps predictably George, who was born in 1873 and who then married Emily Pittman in the City of London in 1896. – George and Emily Chuter had seven children of whom the sixth, Horatio, or “Horace”, my grandfather, was born in 1907 and who, after the premature death of his younger brother Sydney in 1912 was the baby of the family and was clearly doted on by two of his older sisters, Gertrude and Ivy. – Horatio married my grandmother, Dorothy Thurston in 1932 and they had just one daughter, my mother, Vivien, in July 1939 just five weeks before the outbreak of the Second World War. My grandfather, who had been a Territorial, joined up immediately and headed off with the Western Desert Force and the Eighth Army. He fought through Egypt to Tobruk and then up through Italy before being sent off to Palestine after the war had ended. When my mother first met him aged seven she said “that’s not my Daddy!” understandably. – After my parents got married they lived in Twickenham and it was from here that, following the collapse of their marriage in 1964, that my mother moved to my grandparents’ house in Sussex where I was brought up and which became our home. As family trees go, this is very far from exotic! Surrey farmers all around, some of whom then moved to London in the mid-nineteenth century. No dramas. A little tree tracing my ancestry back only to my great-grandparents reveals the more recent simplicity… The simplicity of the Burfords and the Chuters is only matched by the Lacklan, Nibbs, Travis, Pittman, Thurston and Jones families from which my great-grandparents were numbered. This reminds me of a time when at a medical a few years ago a doctor asked me whether there had been any history of serious diseases in my family. I didn’t know of any, so she asked me whether my grandparents were still alive. I said that they had all died in the last few years, aged 88, 90, 92 and 93. 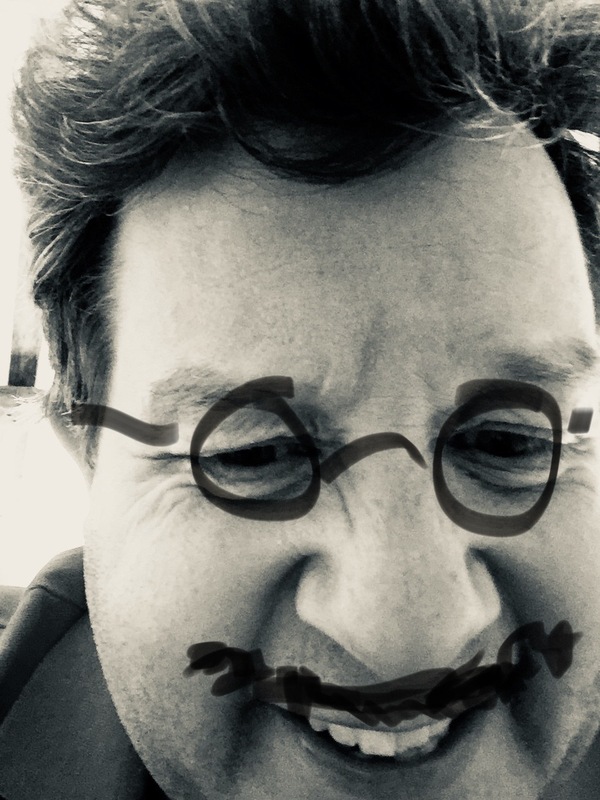 I notice from the family tree above, however, that my eight great-grandparents managed an average lifespan of 74 – the trend is “improving”!